A bevy of reveals today from the new Trial Deck, including the obligatory starter and on-hit Stride, that further solidify Chouchou’s style of shoving mermaids under a rock the deck for fun and profit. AUTO (V): When this unit’s attack hits a vanguard, you may choose up to one of your rear-guards, and either return it to your hand or put it on the bottom of your deck. If you put a card in your deck, draw two cards. AUTO (R) GB1: [SB1, choose another of your rear-guards with “Chouchou” in its card name, and put it on the bottom of your deck] When this unit attacks a vanguard, you may pay the cost. If you do, draw a card, and this unit gets Power +2000 until end of battle. AUTO (R) GB1: [CB1, choose another of your rear-guards with “Chouchou” in its card name, and put it on the bottom of your deck] At the end of the battle this unit boosted a vanguard with “Chouchou” in its card name, you may pay the cost. If you do, draw a card, choose up to one card in your hand, and call it to (R). 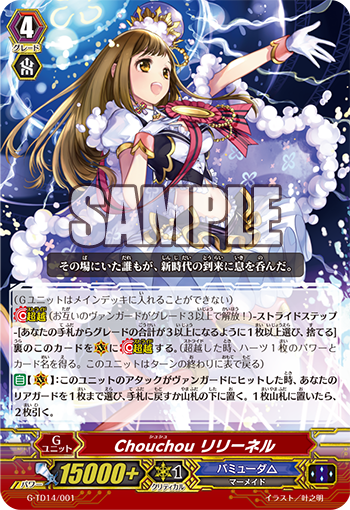 AUTO (R) GB1: [CB1, return this unit to your hand] When your other rear-guard with “Chouchou” in its card name is put into the deck, you may pay the cost. If you do, draw a card. “Chouchou Lilynel” is a Gunit whose ability can be used from your first Stride. When her attack hits a Vanguard, you can return 1 Rear-guard either to your hand or the bottom of your Deck, and then if you returned a card to the Deck, you get to draw 2 cards! Of course its ability that allows you to activate the ability of cards returned to the hand, but you can return Trigger Units back to the Deck, and drawing 2 cards is great. It’s good as it’ll further the battle field if you combine it with the ability of Units whose skills activate when returned to the Deck, such as “Chouchou, Tino”. Continuing, “Chouchou, Ristella”, when it attacks the Vanguard,, you can place 1 ally Rear-guard on the bottom of your Deck, draw 1 card and it gains Power+2000! Not only will you have a 11000 attacker, but also drawing a card is pretty intense. You can return Trigger Units back to the Deck, allowing you to greatly increase the pressure on your opponent! “Chouchou, Marl” is a Support Unit that allows you to continuously attack without burning out your hand. When she boosts a “Chouchou” Vanguard, you can return another “Chouchou” Rear-guard to the bottom of the Deck, draw 1 card, then call 1 card from your hand to the Rear-guard Circle. And since its Cost clears a Rear-guard Circle for you to Call a Unit to, you’ll be sure to be able to continuously attack. “Chouchou, Sasha” is a First Vanguard whose ability activates when an ally is returned to the Rar-guard. When a “Chouchou” Rear-guard is placed in the Deck,, she can return herself to the Deck to draw one card. By combining her with the Return to Deck abilities of “Lilynel” or “Ristella”, you’ll be able to actively activate. From here on out, we’ll be introducing cards 《Bermuda Triangle》 cartds. Also, for today’s “Weekly Vanguard News Bits NEXT”, we’ll be introducing a Generation Rare from “Prismatic Divas”!